The historic buildings may have given way to high-rise hotels, and fishing to foam parties, in this former Catalonian trading port, but the region's fiery spirit is still evident, which is why Lloret de Mar is regarded as the liveliest holiday spot on the Costa Brava. 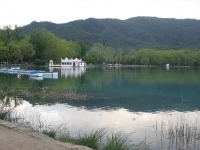 As a resort, the town caters mainly for the 18 to 30 age group but is also popular with families with older children. There are seemingly hundreds of British bars, discos and clubs to choose from, and the days are packed with programmes of beach frolics and fun. The resort has five rough sandy beaches, a massive water park, an aquatic zoo and a theme park. For a taste of the real Spain visitors can revel in the local cuisine or gather in the town's Placa de la Vila on Saturday evenings to join in when locals dance the traditional Catalonian Sardana dance. There are a multitude of shops and markets to choose from in Lloret de Mar, and plenty of time for holidaymakers to browse, provided they can bear to leave the beach. The main shopping enclaves, from malls to small kiosks, are centred in the streets behind the waterfront. Wares tend to be touristy items, from souvenirs to bathing suits, and prices are generally reasonable although quality may be lacking. Some of the smaller shops close in the early afternoon hours and on Sundays, but in general visitors can shop happily from around 9am until late at night any day of the week during the busy summer season. The traditional local market is held every Tuesday on the Carrer dels Mestres, and there is a municipal market every weekday in the Carrer Senia del Rabic and Carrer Verge de Loreto. There is a wide variety of cuisine available in a plethora of restaurants and fast-food outlets at Lloret de Mar, from the best of British to traditional tapas, at very reasonable prices and generally good quality. Favourites with holiday-makers are strawberries and cream, Sangria (fruited sparkling wine) and delicious dishes of paella (seafood risotto). Many of the local restaurants in the old town offer a 'menu of the day' deal including two courses, dessert, bread and even wine for a few Euros. There are also Tex-Mex, Chinese and various other flavours to indulge in. The nightlife in the holiday resort of Lloret de Mar is exhilarating, with its hundreds of bars and 30-odd nightclubs pulsating all night, particularly along the Avinguda Just Marles I Vilarrodona strip of the old town. Night owls who stroll along here in the late evening are accosted by touts offering free tickets and drinks vouchers for the clubs, and partying here can be as cheap as it is lively. Among the more popular clubs and pubs are Bumpers, renowned for its Caribbean cocktails and glass dance floor; Moby's, where karaoke is the popular entertainment; and Tropics, the biggest and best nightclub in town where guest DJs rock the night with a mix of house, rock and trance music enhanced with laser lights and foam. Families opt for friendly 'home-style' pubs in the suburb of Fenals, where kids are entertained and the favourite English soap operas are screened. 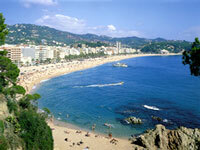 Days are usually spent enjoying Lloret de Mar's seafront and the shingly beach that slopes sharply into the sea, making ideal conditions for a variety of water sports for holidaymakers to enjoy, from lazily pedalling boats, skimming the surface on a windsurfer, or scuba diving into the depths. Other diversions include a host of holiday activity facilities like go-karts, bungee jumping, a mini-train, a bowling alley and horse riding. For a change of scene visitors can head off to the Waterworld aquatic park, or play a round of golf at nearby Santa Cristina de Aro. 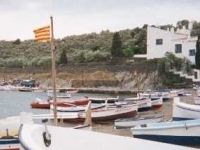 Most visitors opt for one or more sightseeing excursions during their stay: local operators, hotels and package tour companies offer a wide variety of outings from exploring Old Girona to coastal cruises and wine tasting in the Catalan countryside. Most popular are trips to the huge theme park at Salou and Marineland near Blanes, both a few hours drive away. Those who wish to get away from it all can opt for one of a series of mapped walks along the coast or to traditional villages inland. The beach is comparatively small and becomes very over-crowded in the height of the season.